The long stem roses are being handed out to the ladies in the wedding party....Beautiful idea! was perfect! Even better than it appears! We will use them again. One word AWESOME!! From ordering to adding more and still got them on time. The moms simply loved them. Top notch service and product. Thanks!!! Great gift for mom on senior night! From Stephen Martino of Piedmont, Missouri on 1/19/2017 . From Anonymous of irwin, Pennsylvania on 12/8/2016 . I can't wait for my son to go the dance with the most unique boutineer ever!! From Anonymous of High Point, North Carolina on 11/15/2016 . I ordered football, basketball and baseball roses for my husbands grave. These are PERFECT! He would be so happy with these. From Shannon McCarthy of Morenci, Arizona on 5/5/2016 . Our Senior moms were so touched with these roses. I was so pleased with them as well. They are perfect and Thank You again for getting them to us on time especially with such short notice!! I will continue to use your company for years to come!! From Jennifer Samples of Cordova, Alabama on 4/25/2016 . From Anonymous of St louis, Missouri on 3/15/2016 . These roses are darling. I had never seen them before and they are going to be for my fiancé and my mother at our wedding instead of giving them a real flower that will die. We all love baseball and this is going to be perfect. From Harmony Desroches of Afton, Tennessee on 3/3/2016 . I knew the baseball rose would be awesome, but in person it's absolute baseball perfection. I'm going to order more! From B. Alamillo of LA, California on 12/21/2015 . These sport roses are AMAZING! Very detailed, unique, will last a lifetime & very well packaged! From Anonymous of Syracuse, New York on 8/18/2015 . Great idea. Shipped quickly. Great product. From Lynn marie Witt of depew, New York on 7/23/2015 . I purchased this for a baseball themed bridal shower. My best friend does not like to wear coursages. So I thought it would be a perfect keepsake for her as a reminder of her shower for years to come. I placed it across her place setting at the head table. she absolutely loved it. so did everyone at the shower. Everyone was asking me where I purchased it and of course I told them about your internet store and highly recommended them all to your store. The quality of the rose was extrordinary. Unique product, great customer service and shipping was fast. From fran burke of Litchfield Park, Arizona on 6/23/2015 . Ordered this for my hubby who played baseball and now coaches. He absolutely loved it. It came quickly, and was boxed very nicely. Quality stuff; made very well! Would recommend this for anyone who loves sports! From Anonymous of Meriden, Connecticut on 5/23/2015 . Love it, purchased it for my son's senior night for baseball! Thank you!! From Tandra Arst of Marshall, Texas on 5/20/2015 . Quality was amazing! Shipped on time I was very pleased with the quality of the product - received many compliments! From Rebecca Santos of Robstown, Texas on 5/18/2015 . These roses were gorgeous and my baseball player Loved them.....Used for corsage and boutonniere for Prom, They were a Hit!!! THEY WERE A HIT! SENIOR BASEBALL MOM'S LOVED THEM! From Anonymous of Huntingburg, Indiana on 5/14/2015 . THEY WERE PERFECT! THANK YOU! A NICE TOUCH FOR OUR BASEBALL MOM'S ON HIGH SCHOOL SENIOR NIGHT! From Anonymous of Anaheim, California on 5/11/2015 . The roses looked like real rose buds. Very professionally made. The service was outstanding. The roses were a great addition to our event. From Stephanie Evans of Belpre, Ohio on 5/11/2015 . Awesome gift for senior night. Great gift for our Baseball Senior Night! From Carie Lewis-Cox of Oklahoma City, Oklahoma on 4/29/2015 . The roses were beautiful, very high quality. Everyone loved them, I hope I've started a new tradition for our Baseball moms on Senior Night! PERFECT GIFT FOR SENIOR MOM'S! From Gina Encinias of Clovis, New Mexico on 4/28/2015 . This is an EXCELLENT gift for Senior Parent Night. I loved this so much I want one of all my sons (past and current players) for Mother's Day! 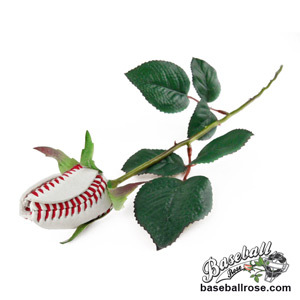 A baseball rose for a baseball mom...PERFECT!!!!! Thank you for this wonderful idea! YOU ALL ROCK!! From Olivia Vergara of Los Angeles, California on 4/27/2015 . From Kim Hawkins of Smyrna, Tennessee on 4/13/2015 . Using for Senior night! Cant wait to give them out! They are perfect! From Tammi of Hobbs, New Mexico on 4/13/2015 . These baseball roses are the most lovely keepsake ever!! High quality beautiful roses!! From Felix the Cat of Conneaut lake Pa, Pennsylvania on 3/9/2015 . The turn around was dead on. They were there when they said it would be, could not be more pleased with the roses if the wedding day is as great as the rose it will be75 and sunny perfect. From Tammy Bernier of Osteen, Florida on 2/22/2015 . From Teresa of Stockton, California on 2/12/2015 . Super cute. Love the personalized message along with the customized name/# on the rose. Perfect gift for guys since it's too girly to give them real flowers. Super fast shipping too and they provide you with the tracking number so you're aware when it's coming too. From Anonymous of Stockton, California on 2/12/2015 . From Jennifer Gallagher of Bozeman, Montana on 2/12/2015 . From Cami J. of Morton, Pennsylvania on 2/7/2015 . These roses were the perfect gift for my baseball-pitcher boyfriend. They arrived in time for our anniversary, were beautifully packaged and the best part is that they made him so happy! Thank you Sports Roses! Cant wait to see your Soccer roses! From Anonymous of Rockledge, Florida on 1/25/2015 . My fiancée and I are both huge baseball fans, and plan to integrate baseball into our wedding. What better way than with Sports Roses. We ordered four as a test, to see how they are. We plan to work with Sports Roses to create smaller length stems for our Table Centerpieces! From Corrine Otero of Rio Rancho, New Mexico on 12/18/2014 . The roses are lovely! These will be given as a gift to the mothers of our 2015 graduating seniors. Can't wait! From Frances Vela of Corpus Christi, Texas on 12/15/2014 . Perfect for a memory! Amazing service! From Alex Leroux of Dearborn, Michigan on 11/24/2014 . I tried to purchase these for a sudden funeral. The owner called specifically and told me he could get them to me on time. They are beautiful and unlike the rest of the flowers from that day, can live on forever like the memory of my friend. Thank you sports roses! From Tina Norris of Kingsland, Georgia on 11/22/2014 . From Kelly Harden of Spring, Texas on 9/21/2014 . From Anonymous of STONEWALL, Louisiana on 9/18/2014 . From Anonymous of Kissimmee, Florida on 6/21/2014 . Perfect to give a special touch on the baseball fanatic couple on their wedding cake!!!! From Charlie of San Francisco, California on 6/20/2014 . Just what I ordered, came in a timely manner. Im sure my gf will love it. Thanks so much. Will definitely consider using again. From LORI DOMINGUE of Kaplan, Louisiana on 6/19/2014 . LOVE LOVE LOVE THE ROSES. GREAT QUALITY. From Anonymous of Simi Valley, California on 5/26/2014 . Wonderful gift for baseball Mom's. In spring it makes a great Mother Day gift or great gift for a team mom. From Anonymous of Sartell, Minnesota on 4/29/2014 . From Amy Badeau of Alta Loma, California on 4/27/2014 . The Roses are beautiful. Great quality for the money and a wonderful keepsake ! From Anonymous of Brevard county, Florida on 4/25/2014 . I love the idea!! Really cute! I did need to peel some of the glue off the petals that held it together. From JockLene Shedd of Levelland, Texas on 4/21/2014 . We ordered 12 long-stem roses for our senior night at baseball and they were a big hit. From the beginning of the order to the end when we received them it was a smooth process and well worth the wait. Thank you for making our senior night so memorable! From Mary McGee of Citronelle, Alabama on 4/11/2014 . My nephew and his girlfriend were the talk of the town. His friends were all upset because they didn't have them. We didn't know about them in time to let them know. We kind of liked being special anyway. People are still talking about their roses. Next year you'll sell lots of them. People are already asking if you have football roses as well. Perfect gift for mom's of Senior's! From Plainview Bulldog Baseball Boosters of Plainview, Texas on 4/3/2014 . The baseball roses we purchased were awesome. This is the 2nd year we have purchased them for our baseball mom's of Senior's. They love them & it's something to be kept forever. We will definitely keep this tradition going by making future purchases. Thanks so much! From Baseball Mom of Moorpark, California on 3/30/2014 . Awesome product! Even better customer service. Needed to get a dozen baseball roses oh short notice - within a week. I emailed & called the company to find out if they could meet our deadline. Got both a phone call & return email within a few hours from Mark. He assured me that we would have the roses in time for our high school Senior Parent Day celebration. Thankfully, they arrived exactly as promised. The baseball roses were the centerpiece for a bouquet given to each of our moms. Even our coaches were impressed! Thanks to Mark for everything! From Shelli of Pace, Florida on 3/27/2014 . We absolutely love these!! We have ordered the past 2 years for our Mom's on Senior Night & they are a big hit! From Denise of Marietta, Georgia on 3/24/2014 . We ordered these for the moms on Senior Night for Baseball. Super Excited to give them to the moms as I think this will be super special for them as we put the year and their number on the rose. What a beautiful idea and gift! From Debbie Christian of Auburn , Washington on 2/21/2014 . Our son was an avid baseball player, all state recognition, captain of his college baseball team, hoping to be draft eligible, when he was in a tragic car accident and never made it. To commemmorate his life with a few of those that have stayed the closest with us through our grief, we have purchased these roses as gifts. Those who have received them, have loved them. Thank you so much for helping us to make this a very special "thank you" to some very special people in our life. From Anonymous of Yorktown Heights, New York on 2/17/2014 . These hand-made baseball roses are beautiful! They are going to be incorporated into my bouquet for our baseball-themed wedding, and I can't wait to see the end result! From Anonymous of San Diego, California on 1/13/2014 . What a terrific way to tie in our more traditional wedding with the fact that the groom and his attendants are all baseball coaches or have ties to baseball! Thank You!! From A. Brensons of Tampa, Florida on 11/16/2013 . I was very excited when I received my order and saw the product with my very eyes. I can't wait to order more. The Perfect Sports Rose, The Perfect Gift. From Jodi Crandall of Winfield, Kansas on 11/4/2013 . Excellent product, delivery as promised. From Gloria Alvarado of Arlington, Texas on 11/2/2013 . I will give my husband a Baseball Rose a day before our wedding this month. He had play ball since he was 5yrs old, I am for sure he is going to LOVE IT! Will post pict on fb. I recommend this to anyone that love flower plus sports great combo. I show it to all my office peers/coworkers and they were amazed. Thank you so much!! The person that i gave it to as a gift LOVE THEM, something different and unique. I had a bit of a difficulty on the web but them I called to adv what I want it and Mark (person that helped me) was so understanding and right on the dot of what I was trying to do on the web. Everything turn out so wonderful! From Anonymous of FT lauderdale, Florida on 10/18/2013 . From Christie Bazarnic of Williamsport, Maryland on 9/24/2013 . From Claire of Falmouth, Massachusetts on 9/15/2013 . The baseball roses were amazing !! My Groom and groomsmen LOVED them, a great keepsake! From Anonymous of San Pedro, California on 9/9/2013 . Thank you Baseball Rose! My wife is a huge Yankee Fan and this made her day. From Tracy O&#39;Connor of Delavan, Wisconsin on 9/8/2013 . The picture on the site is great, but when I saw the rose in my hands it was beautiful!!! the care that is taken to create your roses is obvious. your craft is one in a million and made my birthday gift a memory forever. thank you! Coolest idea ever and great company all around! From Tiffany Lynn Meyer of Tustin, California on 8/16/2013 . We got the roses delivered even sooner than expected and OMG!!! They are absolutely amazing! We love them, thank you so so much to the whole team for your hard work and detail- they are incredible!!! :) thank you! We are so excited to have them at our wedding, they are going to be a detail everyone will remember for sure!!! Thank you. From Amanda Kauffman of Harrisburg, Pennsylvania on 8/12/2013 . From doris kappel of chicago, Illinois on 8/3/2013 . From nancy gilbertson of lacrosse, Wisconsin on 7/9/2013 . From Amanda Parks of Alhambra, Illinois on 6/30/2013 . We ordered these roses to give to our mothers during our wedding ceremony. I expected they would be cool, but they are so much more! The stems are realistic & not fragile. The rose itself is better than I'd imagined. I highly recommend these for anything special! From Brad Thompson of HUTTO, Texas on 5/25/2013 . From Anonymous of Mesa, Arizona on 5/2/2013 . From Kelly Covey of Covington, Kentucky on 4/29/2013 . I can see this for our baseball moms on Senior Night. Well made. Quality materials. Color variegation in the greenery is quite realistic. From Marilyn Jolliff of Katy, Texas on 4/25/2013 . 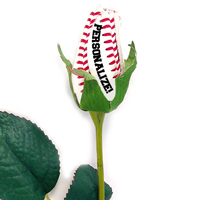 We gave these sports baseball roses to our moms at Parent Appreciation & they loved them. So much more meaningful than real flowers that get tossed away. From Anonymous of League City, Texas on 4/22/2013 . Moms loved these unique roses. They were perfect for our Senior night! From Lindsay erin of Hutto, Texas on 4/16/2013 . well made... LOVE LOVE LOVE IT! From Anonymous of Bridgeport, Ohio on 3/28/2013 . I ordered three of the long stem baseball roses and got the corsage for free being a first time purchaser. My boyfriend was very impressed with them being part of his birthday present. We could not be more satisfied and I have been telling lots of my girlfriends about the sports roses for future gifts ideas for their significant others as well. From Veronica Gutierrez of Tallahassee, Florida on 3/21/2013 . From Anonymous of Amarillo, Texas on 3/18/2013 . From Anonymous of Columbus, Ohio on 3/17/2013 . Such a fun idea!! Perfect for baseball fans! From Diamond Ortiz of Globe, Arizona on 3/10/2013 . These are so neat, and very good quality. I'm sure all the men in the wedding will love these. From Anonymous of Rancho Cucamonga, California on 3/10/2013 . I just bought 6 baseball/6 football roses for my daughter's high school graduation. She made a comment a year ago when we saw them at a Cubs Spring Training game, that these are the "only roses she wants to receive"! They are perfect for that girl who loves sports ... absolutely perfect!!! Great idea! Would love to see a soccer and basketball rose too!!! From Liza Hastings of LEWISVILLE, Texas on 3/10/2013 . Planning to use the baseball rose for senior night. They were used for the first time last year and it was a HOMERUN! They are beautiful and perfect for Sr. Night!! From Rebecca Ratliff of Abingdon, Virginia on 3/9/2013 . The roses are a perfect gift for sports fans. We always give the moms roses on senior night and these will make it even more special & unique. Thanks! From Patricia Lowrance of bethalto, Illinois on 3/8/2013 . Baseball roses are an awesome item!!! I think this company is a HOME RUN COMPANY!!! PERFECT gift for Baseball Fans! From Baseball Mom of Mansfield, Texas on 3/4/2013 . These roses are absolutely beautiful and will make such a unique gift for my son's trainers. A simple rose represents so much as it is. The fact that these are baseball roses makes their value and meaning priceless! From Wendy of albuquerque, New Mexico on 2/28/2013 . What a neat idea for any baseball parent. I am looking into our players giving a baseball rose to their moms at the end of the season. Will definitely be ordering again! From Deanne Crim of Glendale, Arizona on 2/21/2013 . From Anonymous of Spring, Texas on 2/21/2013 . These are amazing and will look great in my baseball themed bridal bouquet. So glad I found them. And the packaging was a nice touch! From Amy Jaworski of Shelton, Connecticut on 2/18/2013 . This gift was the envy of everyone! From Brittany Rudy of La Verne, California on 2/18/2013 . Love the idea! Shipped before said date! My boyfriend love it. Just a little pricey, with tax and shipping included. incredible gift for a true baseball fan ! From joe suvak of independence, Ohio on 2/18/2013 . My wife is the very proud mother of our 3 baseball playing son's.... and the sports baseball roses were he all-time favorite valentines day gift !!!! they will be be on display in our home forever !!! From Rebecca Pugh of Ferris, Texas on 2/10/2013 . This was a gift for my son's girlfriend. A baseball rose, a softball rose with two live red roses. She was so excited...loved it! From Anonymous of Denver Metro, Colorado on 2/8/2013 . The roses are better than expected! I could not be more pleased! Perfect transaction! This company is VERY on the ball - communication, customer service, shipping, product....they do not miss a beat! 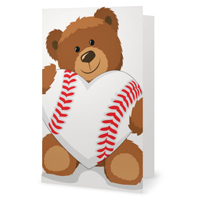 That was the perfect Valentine's Day gift for anyone that loves Baseball! From Cindy Jackson of Moody, Alabama on 2/7/2013 . I purchased this for my daughter to give to her boyfriend on Valentine's Day! It is truly a great gift for a baseball player. Too Cute! From Anonymous of dapto on 1/12/2013 . From Justin Tynan of White City, Oregon on 12/27/2012 . From Victoria of Arroyo Grande, California on 12/24/2012 . I am completely in love - What a great gift for baseball fans. 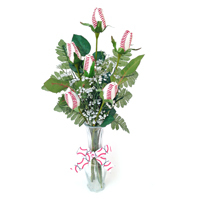 Any woman that loves Baseball would LOVE to receive these Baseball Roses. From Anonymous of O Fallon, Illinois on 12/7/2012 . From Anonymous of Gloversville, New York on 11/8/2012 . The rose was exactly what I wanted and it shipped faster than expected. I do believe the stem/leaves are really fake looking, but I'm using them for corsages anyway. From Anonymous of Littlerock, California on 10/26/2012 . I love these! As a baseball fan, they are a fun way to show that. From Jill Jones of Sublimity, Oregon on 10/22/2012 . LOVE the roses.... would be perfect if they came with babys breath as well. Incredible idea, great gift! From Connie Smith of Thonotosassa, Florida on 10/22/2012 . From Anonymous of Naperville, Illinois on 10/12/2012 . From Teresa of Buford, Georgia on 9/15/2012 . Ordered the baseball rose for my daughter's wedding. It's going to be perfect. From Anonymous of Lansing, Michigan on 8/29/2012 . I had a semi-casual backyard baseball themed wedding reception. This was a fantastic idea, pricey but so worth it. I had everyone in awww over the baseball roses. From Anonymous of Des Moines, Iowa on 8/22/2012 . After seeing these during Spring Training in Arizona this year, I thought I would suprise my wife with a memory of a great trip and add flair to our baseball themed room. She was amazed that I had remembered these, and she LOVED them! A must for that special "baseball" lady. From Jacie Wilson of New Richmond, Indiana on 8/9/2012 . My son and his fiance are using them in the bride and grooms flowers as well as the grooms Mother, Father and Grandmother's flowers. We are huge Cincinnati Reds Fans and love baseball in general. These flowers fit us perfectly! 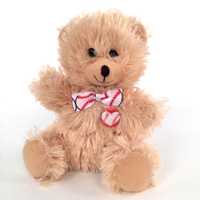 Perfect Gift for Baseball Theme Baby Shower! From JoAnn Vinciquerra of Peoria, Arizona on 8/5/2012 . I once again ordered a dozen of your amazing Baseball Roses for a baseball theme baby shower I will be attending at the end of August. They were perfect for what I wanted, as they came separately and not in a bouquet, and I used 6 of them for the arrangement I made (It's posted on your FB page) and I kept 6 for another baseball fan of mine. I can't wait to give them to the mother to be and I know she is going to be blown away when she sees them! I will continue to spread the seeds of your roses whenever the opportunity arises, and I think the baby shower is a great place to do that. I am a very happy customer and you will be hearing from me again in the future! Thank you for the fast delivery and producing such an awesome product! From Christine E. of Wilkes Barre, Pennsylvania on 8/5/2012 . As a huge baseball fan, I have admired these rose for quite some time. And when you had your sale a couple of weeks ago, it was the perfect time to but one for my self, and my stepdaughter. And they were all that I hoped for and more--beautifully crafted, and the perfect complement to my baseball collection. From Anonymous of Brick, New Jersey on 8/4/2012 . Loved, loved them. Purchased as a gift for the 1st birthday for the daughter of a major league pitcher!! They were a hit. Others asked where did you get them?? Very happy!! From bphrball of Denver, Colorado on 8/4/2012 . Ordered the baseball roses on the "special" and received them very fast. Thanks for the great service, the recipient loved them. 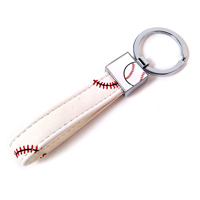 Perfect Gift for the Ultimate Baseball Fan! From Melinda Bantz of Dallas, Texas on 7/23/2012 . 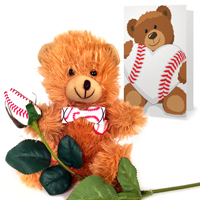 The baseball roses are the perfect gift for the true baseball fan. They are beautiful and will be home run at my upcoming wedding. From Anonymous of Katy, Texas on 7/23/2012 . From Anonymous of Fontana, California on 7/22/2012 . The baseball roses are amazing. So unique and will last a lifetime. A must have for any baseball fan. From Anonymous of forestville, New York on 5/30/2012 . even the guys like getting roses! my son really thought it was cool. Amazing High Quality Unique Product!! From Lori Barbari of Gilbert, Arizona on 5/28/2012 . We wanted the baseball roses for the Senior's Mom's for our baseball banquet. We needed the order "rushed"...we rec'd our roses exactly when promised & they far exceeded our expectations! They were even singly wrapped like a "real" rose. Amazing quality workmanship. We ALL absolutely LOVED them. I will definitely order again. From Trish of Corpus Christi, Texas on 5/14/2012 . These roses were beautifully made. The staff was very helpful in making sure the delivery method I selected was correct and would be on time for my event. They even saved me some money too. From Anonymous of Sherman, Texas on 5/14/2012 . The roses are beautiful. They are being used for boutonnieres for my son's wedding and they turned out great. From Sue Martin of Dallas, Georgia on 5/13/2012 . I love the baseball roses I ordered as Team Mom gifts. I ordered on the 27th thinking I had plenty of time for it to arrive prior to team party on the 8th. It was on my porch after I arrived home from the party. I was very disappointed that it took so long to ship and tracking was a little difficult a few days along the way. From Sara of Lakewood, California on 5/11/2012 . From Katie of south san francisco, California on 5/11/2012 . these are great. what a unique way to incorportate my passion for baseball and the start of my new life. They are lightweight and look very real. Everyone I show them to does a double take. They are definatly one of a kind. I will be ordering more!!! From dj of boonville, New York on 5/10/2012 . these roses are beautiful!!! !can't wait to give these out.Thanks!!! From Debbie of Phoenix, Arizona on 4/30/2012 . We used these as a gift to our players moms on senior day. They were combined with a couple red roses and some greens and we attached a photo of the player. Everyone loved them and they are something we can keep forever! From Anonymous of Rochester , New York on 4/21/2012 . The recipients of these flowers were so happy and thought these roses were great. Thanks for such great work!!! From Lisa Baumann of Waconia, Minnesota on 4/21/2012 . These flowers are very cool. I am going to set them out for my son's graduation party. A little spendy for just a couple roses but fun. From Anonymous of Hamilton, Ohio on 4/9/2012 . From Rhonda of Swift Current, Saskatchewan on 3/23/2012 . Love the Roses -I'm getting lots of ooos and ahhs about them. They will be a keep sake for many years! From carol salber of Philadelphia, Pennsylvania on 3/18/2012 . This was the best gift to my son and his future wife. From Anonymous of landisburg, Pennsylvania on 3/1/2012 . From Kellie M of Moon Township, Pennsylvania on 3/1/2012 . My daughter loved her baseball rose!! She quickly put it on her Facebook and Twitter and everyone else thought it was great! Thanks for such a unique product. Service/shipping was fantastic. From Michelle of Detroit, Michigan on 2/27/2012 . From Anonymous of moreno valley, California on 2/21/2012 . amazing product and my boyfriend loved it. thank you!! From Jill Pearson of DOBBS FERRY, New York on 2/14/2012 . They are adorable, quite pretty, well made. I am keeping one for myself and will gift the others. I am sure my friends who get them will be quite pleased. It is a great idea for any baseball fan. It would be wonderful to get an MLB team logo on the rose somewhere, that would be a great addition! Great gift for the Hubs! From Anonymous of Rancho Cucamonga, California on 2/11/2012 . From Kristina of Santa Ana, California on 2/9/2012 . Great product. Unique and well made. From Jessica of Baltimore, Maryland on 2/8/2012 . These are amazing! I cannot wait for April to see what they will look like put in my bouquet and transformed into boutonnieres! From Cheri B. of Tampa, Florida on 2/7/2012 . Love them. They are exactly what I wanted for an upcoming event. From Kathy Craig of Olney, Illinois on 2/5/2012 . Love these roses! Very unique! We made a bouquet and boutonniere for prom and can't wait for everyone to see them! From Caryn of Northridge, California on 2/4/2012 . I thought these baseball and softball roses looked great online. However, the pictures do not do let you know just how phenomenal they are in person! The white ball/rose with red stitching really pops, as does the yellow softball. I would highly recommend these to anyone who has played or has a passion for America's favorite pastime! From Abby M. of Willow Park, Texas on 2/4/2012 . My husband is a huge baseball fan and I ordered him a baseball rose for Valentine's Day. It is beautiful, arrived quickly, and as my husband exclaimed "Smells like a baseball!". He's going to order one for his baseball loving friend who just found out they are expecting a baby. Great product, would totally recommend these to anyone! From Teresa Schutzman of Cody, Wyoming on 1/31/2012 . From Amanda Carnes of Granbury, Texas on 1/29/2012 . I loved my roses. I will be ordering again! From Anonymous of Phila, Pennsylvania on 1/16/2012 . Nicely done!! Got them for my dad's 50th and they look great! From Anonymous of Concord, California on 12/11/2011 . Bought these to put into my wedding bouqet. Can't wait to see it all together. From Heather G. of New York, New York on 12/9/2011 . I needed a gift to thank a friend who let me and my boyfriend stay in her house while on the West Coast leg of a baseball road trip. We ended up being a big strain on her, but Baseball Roses proved to be the PERFECT gift to thank her for putting up with us! A huge baseball fan herself, she went to 3 games with us, so I gave her 1 rose for each of the games we attended. Project tip: To commemorate a particular game with a Baseball Rose, tie a ribbon with team colors around the vase you keep them in and write some of the important game info on the end of the ribbon (the date of the game, teams who played, final score, winning and losing pitchers, or a particular player's accomplishments like "Perfect Game" or "First Home Run"). Each rose ends up preserving a great memory! From Bree of Arlington, Texas on 11/15/2011 . I was so excited about ordering these roses for my wedding bouquet. However when I received them I didn't like the red veins in the leaves. I will have to purchase some other greenery to hide the roses' leaves. Other than that I loved the actual flowers.